Warming to the soul, gentle on the belly, and all around satisfying, this is a soup that is incredibly versatile in that you can throw in any veggies you have lying around, serve with soaked brown rice for the big eaters (did I say teenager?) or swap in chicken for tofu, if that’s your fancy. I find this recipe quick & easy because these are all ingredients that I mostly have in the house, so long as I have about a 25 minute window to get dinner on the table, this soup can make that happen! A while back, we were a bit scared off of soy in the health industry due to its phytoestrogen content. Phytoestrogens are plant compounds and dietary estrogens that can only be consumed through food sources. Due to increases in hormone dysfunction and estrogen dominance issues in both men and women, there have been concerns about the regular consumption of phytoestrogens and their affect on thyroid function, reproductive development, and breast cancer risk. Like so many foods, the consumption of estrogen containing foods is problematic for some and beneficial for others. As with all fluctuations in nutritional information, is it always important to do what is right for you, as an individual, with differing preferences, needs, history, and health struggles. If consuming estrogen of any kind is problematic for you, likely it is safest to steer clear. For many others, consuming tofu as part of a balanced, plant-based diet, can be health promoting. “Estrogen has positive effects in some tissues and potentially negative effects in others. For example, high levels of estrogen can be good for the bones but can increase the likelihood of developing breast cancer. Ideally, you’d like what’s called a “selective estrogen receptor modulator” in your body that would have proestrogenic effects in some tissues and antiestrogenic effects in others. As with all foods that have been processed in any way, choosing the right kind makes all the difference! No, we are not affiliates, I just like their product and always love to support local as much as possible! Ok, so now that you’ve expanded your knowledge base on tofu 🤓, you’ve earned the recipe! Cut drained tofu into small cubes and toss with all other ingredients in a medium bowl. Allow to marinade for roughly 1/2 an hour. Bake @ 350F for 35-40 minutes, stirring and flipping cubes occasionally, until browned and a bit crispy. Remove from oven and set aside. In a large soup pot, sauté onion with coconut oil and salt over medium heat until softened. Add ginger, garlic, and cauliflower, broccoli, & red pepper, and sauté another few minutes until fragrant. Add stock, coconut milk, curry paste, sesame oil, tamari, maple syrup and pepper, and stir well with a spatula to remove any clumps. Bring to a gentle boil, then reduce heat to low and allow to simmer for 20 - 30 minutes or until all vegetables are soft but not mushy. Add tofu and greens and allow greens to wilt and tofu to heat through. Serve with a squeeze of lime and fresh cilantro. You may wish to add a few scoops of rice, quinoa, or rice noodles for a larger, more dense meal. Enjoy! If you make this soup, please let me know how it goes!! Better yet, take a most beautiful pic and post it on Instagram or Facebook and tag me 😋! I want to know if you are using my recipes! Don’t want to miss a recipe or an upcoming workshop? Sign up for the Newsletter below! It’s a great time of year to use squash. They are abundant and satisfying, but are also nutrient-rich powerhouses. Butternut is one of my favourites! It is versatile, creamy, full-flavoured, and easy to work with. High in Vitamin C, iron, potassium, magnesium, and bursting with beta-carotene, this starch is low on the Glycemic Index and wonderful for hungry littles, growing teens, and adults needing something satiating. 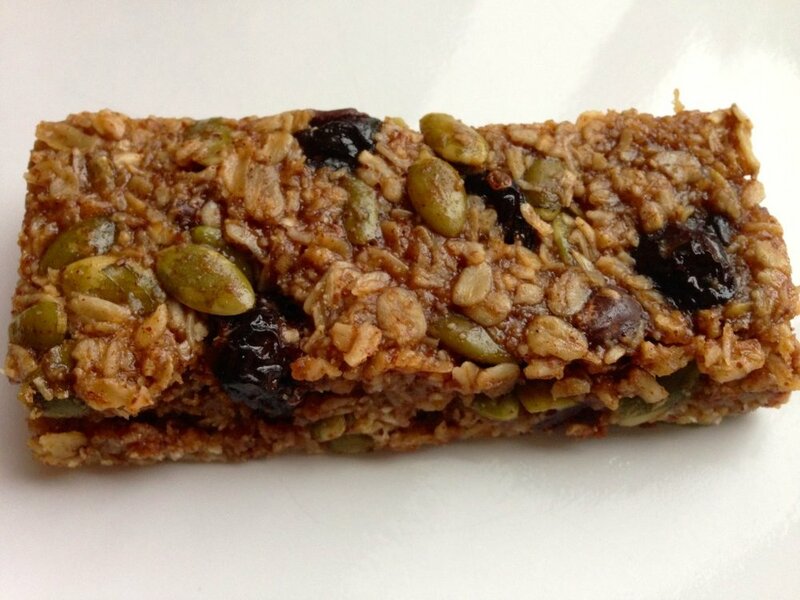 This recipe is simple, quick, and just real yummy! This soup is so flavourful, you needn’t add anything extra! Preheat oven to 400F. Toss squash with 1 Tbsp coconut oil and season with salt and pepper. Roast for 15minutes or until just tender. Heat remaining oil on medium-low, in a large soup pot. Add onion. Saute until soft and translucent. Add garlic and ginger and stir until fragrant. Add veggie broth, apple, cooked squash and remaining spices, and simmer 10minutes or until squash is soft. Add coconut milk and stir. Remove from heat and puree in blender. Return to stove and heat through. Enjoy! It all started with a vision (it usually does) of rich purple hues, a little tartness, a little sweetness, and a whopping load of flavour. This recipe is really easy and loaded with high-quality, nutrient dense ingredients, which I love. It finishes without the heaviness often accompanied by rich, sweet desserts and will leave you with energy as opposed to weight. I love this cake, it’s at the top of my list at the moment. I just used this recipe at a Vegan Cooking workshop last weekend and it was a total hit! The only warning I have for you is that this must be made the night before to allow time for the cashew filling to set. I would slice it straight out of the freezer, but leave it to warm up a bit before serving. Enjoy. Share. Or don’t. Above all, feel good about this one. To make the crust, combine all ingredients in your food processor and process until well combined and mixture sticks together. Press into the bottom of a lined 7” round spring-form cake pan. Place in the freezer. For the filling, combine all ingredients in food processor and process until smooth (this make take several minutes), scraping sides. Pour over crust and gently tap cake pan to settle ingredients. Place in the freezer overnight. Not much more to say about this one, but ENJOY! If you try this recipe, please leave a comment below and let me know how it went! Here’s a pretty simple, easy to bang-off, “dinner party impresser” of a spread. The only real pre-emptive here is that the sunflower seeds need to soak for a few hours before hand. I love to use seeds as a base for sauces, dressings, and spreads, because they are nutritional powerhouses, high in protein, and super satisfying. I’ve got big respect for the sunflower seed; they make great seed butter, are high in magnesium, vitamin E, selenium, support the cardiovascular system, help regulate mood, and are an excellent source of good quality fat. Note: always keep your seeds refrigerated to preserve the integrity of the oils and to keep them fresh and tasting scrumptious. Drain and rinse sunflower seeds and place them in the bowl of your food processor along with all other ingredients. Process until smooth (this will take about 5 minutes), scraping sides frequently with spatula. Serve with chopped veggies and homemade crackers or use as a filling in a tortilla or nori wrap. Will keep refrigerated for up to 7 days. These little babies were inspired by the need for more protein packed lunchbox snackeroos for the little kiddos who can’t pack nuts in their lunches due to school specifications. I came up with these easily, as they’re super quick to whip together, they contain staple ingredients that live in my kitchen, and I love love love the combo of sesame and chocolate: salty-sweet-earthy deliciousness! 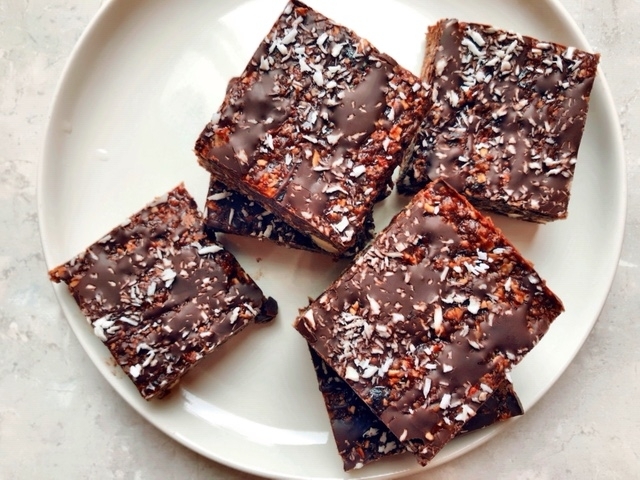 Designed with the littles in mind, these are full of protein, beneficial fats, fibre, calcium, magnesium, and immune boosting antioxidants, they are perfect for an afternoon boost without the blood sugar crash of refined sugar. They are not to be reserved just for your kids though, so hide a couple in the back of the fridge and try them out mid-afternoon when you’re feeling sluggish and unfocused, they are sure to satisfy in many ways! Enjoy!! Toast sesame seeds in a hot, dry, frying pan over medium heat until lightly brown. Remove from heat and empty onto a small plate and set aside. In a food processor, combine soaked dates, tahini, hemp hearts, salt, and cacao. Blend until smooth and well combined. Add dried cranberries to processor and pulse a few times until they are incorporated, but not blended. Using clean hands, roll 1-2 tbsp of mixture in your hands until a smooth ball is formed. Roll each ball in toasted sesame seeds until completely coated (or just coat half). Place onto a cookie sheet. Place finished balls into the fridge until firm (2-4 hours). Store refrigerated. Will keep 3-4 wks in fridge or 6 months in the freezer. Be sure to let me know how these work out for you! It is Fall Harvest and plums are in abundance! This crisp is super simple but really really good. Gluten-free and made will all ingredients that live in my house, it’s an easy one to pull off for a dinner party, potluck, or just because there are loads of plump purple goodies begging to be baked! I served the leftovers to my boys in the morning with a dollop of coconut kefir and we all felt good about that! 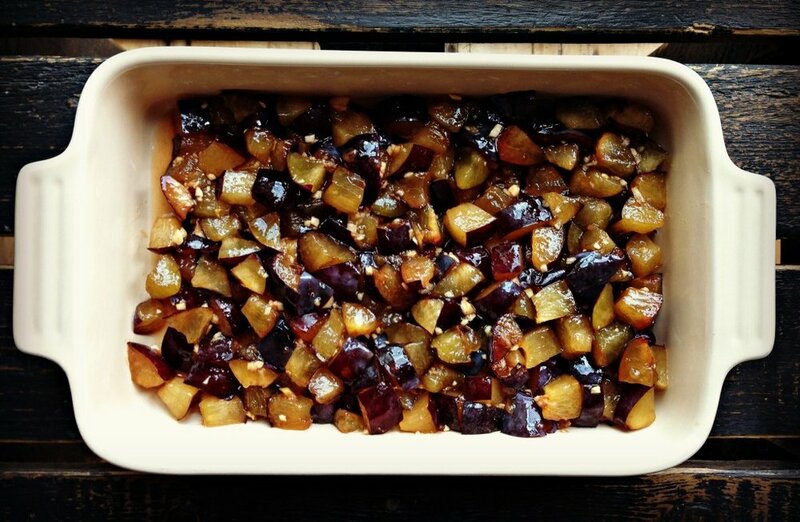 In a medium bowl, combine plums, minced ginger, maple syrup, and sea salt. Spread evenly along the bottom of a small glass or ceramic baking dish (mine is 6 x 8). For the topping, combine all ingredients in your mixing bowl and spread over top of the fruit bottom. Bake for 40-45 minutes until edges begin the brown and you see the juices boiling along the sides. Serve with coconut whip cream or coconut vanilla ice cream. I have a secret (not-so-secret) love affair with roasted cauliflower. It is sooooo good! This recipe began with some roasted cauliflower amazingness and just exploded in flavour from there. This particular salad is spectacular for lunchtime. It is easy, makes a good sized batch, is filling and satisfying, grounding, and is well-rounded without needing anything else along side. I’m a big fan of eating grains at lunchtime, as we digest them better than in the evening, and they tide us over throughout the afternoon slump without any sugar highs and lows. I do have to say something about this dressing. So make a double batch if you have it in you and use it for leafy salads, salmon, over cooked veggies and rice, or just spoon it right out of the jar. Go for it! Feel free to add in some of your favourites to this salad, it could easily handle some cucumbers, spinach, steamed kale, toasted almonds, pumpkin seeds, or fresh dill. Or don’t, tis straight up good just the way it is! (just like you). 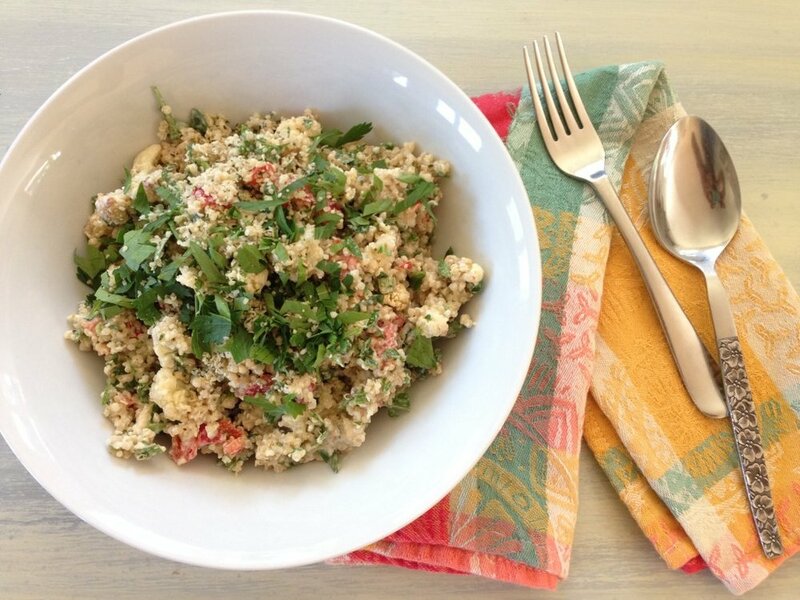 To cook quinoa: in a small pot, bring quinoa, water, pinch of salt and an optional tsp of coconut oil to a boil. Reduce to simmer and cook until all water has been absorbed (about 15 minutes). Remove from heat and allow to cool at least half an hour. To roast cauliflower: preheat oven to 375F. Toss cauliflower pieces in 1-2 Tbsp of melted coconut oil and sprinkle with sea salt. Bake for 20-25 minutes until lightly browned and soft. Set aside. In a large bowl, combine all salad ingredients and toss together with a fork. For the dressing, place all ingredients in a high-powered blender (although a regular blender will do the trick), and combine until smooth. 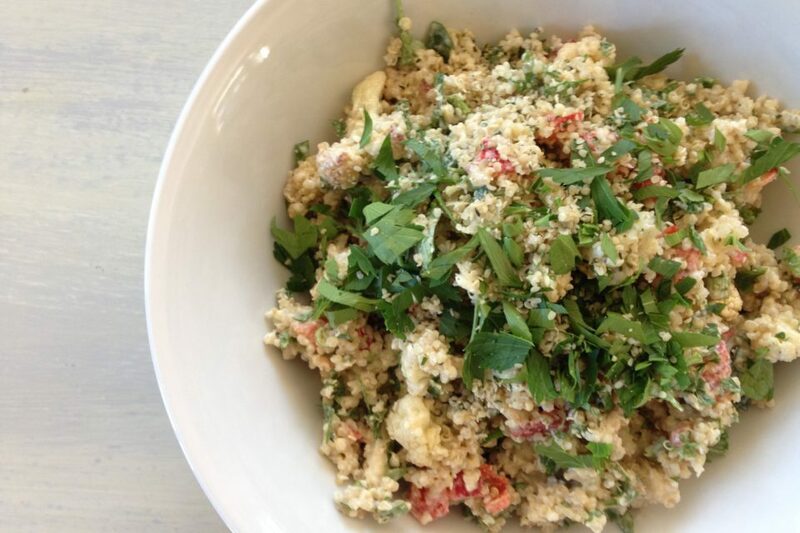 Toss salad with a generous helping of dressing, sprinkle with hemp hearts and parsley and serve. Will keep in fridge for 3-4 days. On a dark and stormy night, with the first fallings of snow, the candles were lit and the soup pot was a calling. This soup created a buzzing of mmmm’s and ahhhh’s and this creative chef did a little slippered happy dance around the kitchen when it was finally time for the final reveal! Great for a Sunday afternoon, when you’re in the house putzing about, or a weekday meal, this soup will fill the house with sultry aromas of roasting garlic and red peppers, and satisfy your desire for a creamy soup without the addition of dairy. Preheat oven to 400F. 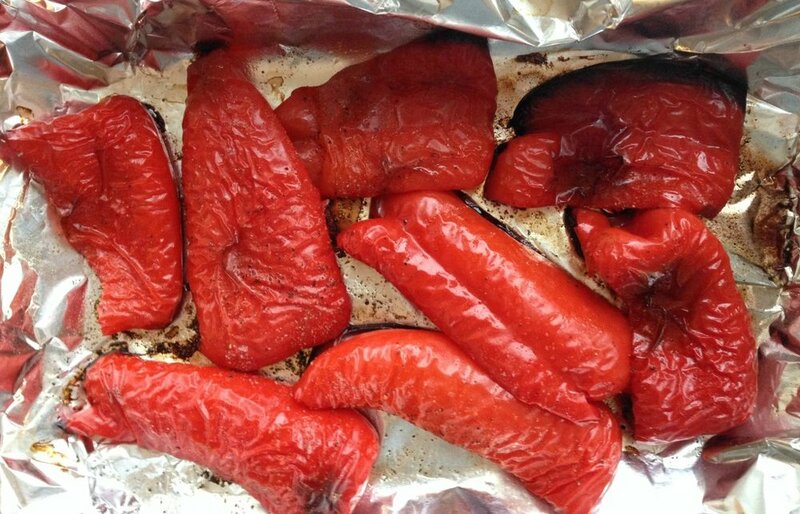 Cut red peppers in half and place skin side up on a lined baking tray. Drizzle with coconut oil and season with salt & pepper. Cut tops off garlic bulbs. Drizzle with coconut oil, season with salt & pepper and wrap in aluminum foil. Roast peppers and garlic for 35-45 minutes until nicely soft and skin on peppers begins to bubble. Remove from heat and set aside to cool slightly. Meanwhile, in a large soup pot, melt coconut oil and add onions, and stir until softened, about 5 minutes. Add garlic and salt and stir for another 2 minutes or until fragrant. Add diced tomatoes and spices. In your blender, combine cooled peppers and roasted garlic cloves (just squeeze them out from the whole bulb), cashews, and stock. Blend until smooth. Add cashew blend to your soup pot. Bring to a gentle boil and then reduce heat to low and simmer for 15-20 minutes. Adjust seasoning to your desired taste. Serve with drizzled coconut cream, your favourite crackers, kamut toast, or straight up. Delicious every way! I hope you enjoy this soup as much as we have in our house! This one has quickly been added to the home staples and soup repertoire, and is perfect for the onset of this wintry beauty! The wintry days beckon a healing pot on the stove and this soup is a front runner in nutrient density, protein power, and broth soothing satisfaction. A simple twist on a warming tomato lentil combination, this soup will satisfy both your tastebuds and your hungry belly. It is best served on the second day, once the flavours have been given some time to settle and merge together, and with a hunk of fresh spelt bread from the neighbourhood baker (thank you Ymir Bakery!). Creamy Coconut Lemon Filling meets Avocado Chocolate Mousse. This cake not only looks spectacular, inciting noises of mmm’s and ahh’s, it is also quite easy to whip up. As with all raw cheesecakes, you do need a little for thought, as these decadent desserts need to set overnight in the freezer. 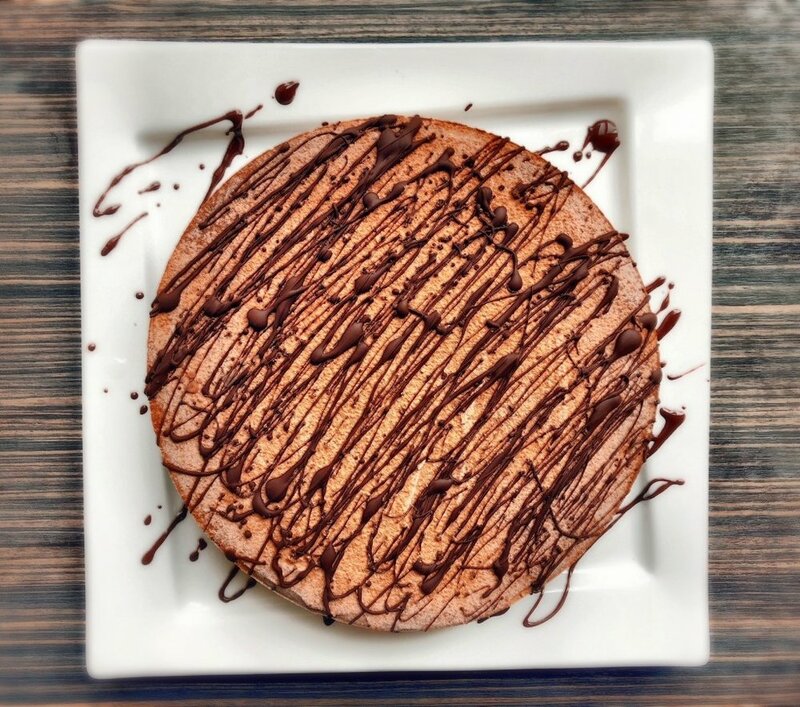 Feel free to make this style of cheesecake your own, depending on what you have on hand or what’s in season. 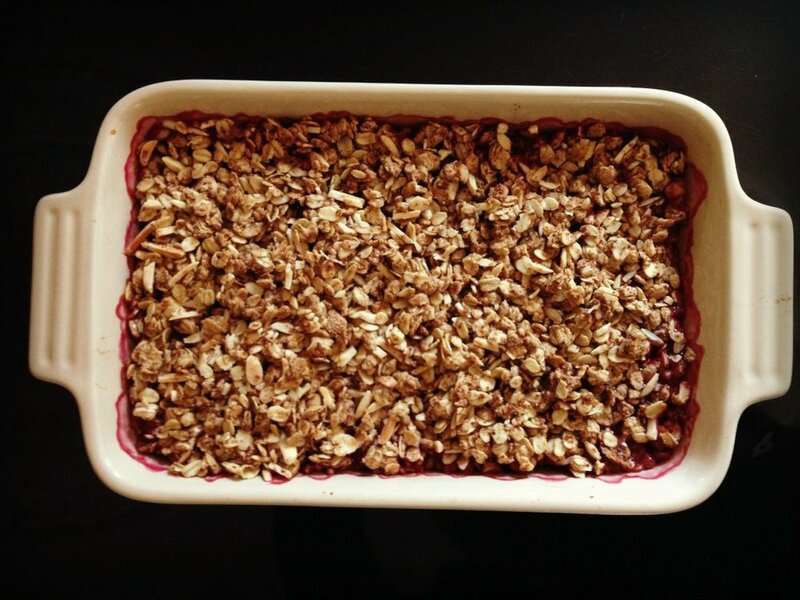 You may feel like adding a cup or so of fresh raspberries or peaches to the middle layer or covering the chocolate mousse with toasted coconut flakes and raw cacao nibs. Any which way, I have ultimate confidence in the satisfaction level of this layered beauty. However you make it, be sure to savour every bite! For the Crust: Combine all ingredients in your food processor and process until a coarse meal forms (do not over-process or it will lose it's crunchy-goodness appeal). With wet hands, press crust into a lined 8 x 8 springform cake pan. Place cake pan in the freezer. For the Cheesecake Filling: Combine all ingredients in your food processor and combine until smooth. This may take several minutes. Note: if it looks like the mixture has curdled, just continue processing, it will become creamy with a little patience. Pour over crust and return to the freezer to set for at least 1 hour. For the Chocolate Mousse: Combine all ingredients in your food processor and combine until smooth. Pour over top of the hardened cheesecake and smooth top with a spatula. Return cake to the freezer and allow to set overnight. When it is time to remove the cake from the pan, run a thin knife under very hot water and slide it along the sides of the pan. While still quite frozen, use this warmed knife method to cut the cake into slices. I recommend allowing the cake to soften before serving - rest on the counter for 15-20 minutes. It is important to remember to soak the cashews overnight the night before. The cake will also need an hour to harden in between adding the cashew layer and topping with the mousse.